I believe numprint.sty is not working. at least the manual states that Printing negative numbers in red does not work. 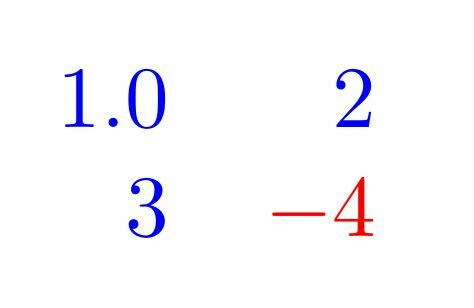 Only the minus sign is printed in red. When was this bug introduced? Some earlier sx solutions that are based on a gobble of the minus sign don't propagate through macros. 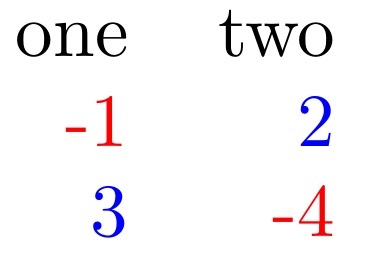 however, an adaptation of tikz (as explained in How to test if a number is negative) works. I tried many variations, and I would guess my error is obvious to the eye of the expert and easy to fix. advice (as always) appreciated. PS: til tantau seems like a genius to me. how in the world did he manage to code tikz into tex?? 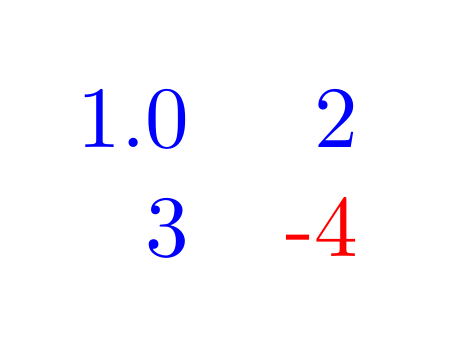 a moment ago, I also discovered christian feuersaenger's pgfplotstable and marco's answer in Automatic coloring of numbers according to size . this may be adaptable, too. except for its long names, pgfplotstable looks insanely great---it has the ability to make whitespace or '|' the tabular separator! wow. I presume pgfplotstable means giving up booktabs, array, and a couple of other tabular enhancements that I have become fond of, but it seems worth it. of course, if I do this, the above question is probably obsolete. It is easy with the collcell package. This is possible with siunitx too. It provides the option negative-color = <color> which can be used with S column type. 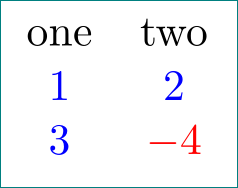 Advantage of siunitx include many formatting options for numbers in the document. red if it starts with a minus, blue if it starts with a different catcode 12 character, black otherwise. Not the answer you're looking for? Browse other questions tagged tables color pgfplotstable or ask your own question.